I still need a good backup system for my pictures and iTunes collection ! But if possible I would also love to be able to use this system as a HTPC, maybe even one that could generate HD output ! Because of this need, I’m currently keeping track of a small wish list that could be used to build this HTPC. So for all people who are interested or would like to help me in my quest, here is the current state of that list. 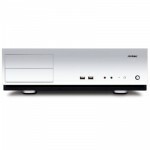 The main issue everyone will have with building a HTPC is the choice of the correct case. This because it has to look nice enough that it could sit around in the living room, but still has to be functional enough to actually be a pc. There are 2 reasons why I would go for this mobo… one is actually very obvious, it’s cheap ! Compared with the features you get, it really is. The second reason is the HD playback functionality and the added HDMI port. This AMD cpu would seem like something not quite top notch, but it has some HTPC advantages. First of al it’s wattage is only 45W, one great feature for a pc that could be running a long time. Second one, related to the first, is the fact that the cpu will not get that hot so we can have some liberty on choosing a cpu cooler. 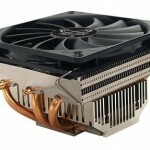 This Scythe Shuriken cooler is small, seems to be very quiet and would be enough for the cpu at hand. A small note though, a Scythe Ninja mini would also be a good option ( could be used without fan ), but is a bit more expensive. Western digital has come up with a green series of their Caviar products ! Meaning the HD will also be less power consuming… again a big plus for any HTPC. Nothing fancy here… just 2 simms of 2gb memory to get to 4gb. Well there you have it ! My current HTPC wishlist… and to give you a good estimate, it’s possible to build this for € 400 or less. 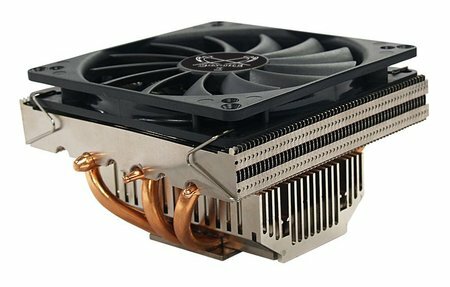 Hopefully I won’t regret going with the retail cooler. And I didn’t need a HDD since it will be netbooting from a LinuxMCE server. But for under half the price, doesn’t seem like too much worse. Good luck with yours once you get it! Hey Enki… well indeed a boxed version of the cpu with cooler could be ok !